I love spring. Spring is the beginning of a cycle that has occurred forever. Plants, animals, and people start to grow and thrive….choking back theme from “The Lion King”…. At the University of Memphis, where I study, we have several organic community gardens where individuals throughout the city can come and collect the various fruits and veggies. Memphis is not know for being the healthiest city in the U.S., in fact it as been on the “Top Unhealthiest Cities” list more times than I wish to remember. So, having a garden like this is a real step up for us. During the “Earth Month” festivities, I had the opportunity to stop by the gardens and see what’s we are planting. The gardens have a number of herbs already growing. I picked some while I was there. I am going to dry them to use in some of my soaps. This month, we are preparing the planters for new veggies. The gardeners have already planted such exotics as bitter melon, commonly used in Asian cuisine, and Native American sun chokes. There are three plant beds devoted to jalapeno and other peppers popular. Eggplants, common to Mediterranean and Middle Eastern meals is also growing in the gardens. The gardens will also have traditional southern cuisine like corn, okra, and watermelons. 2012 also happens to be the 100th year anniversary for the University of Memphis and each of the departments has created a unique tiger mascot. 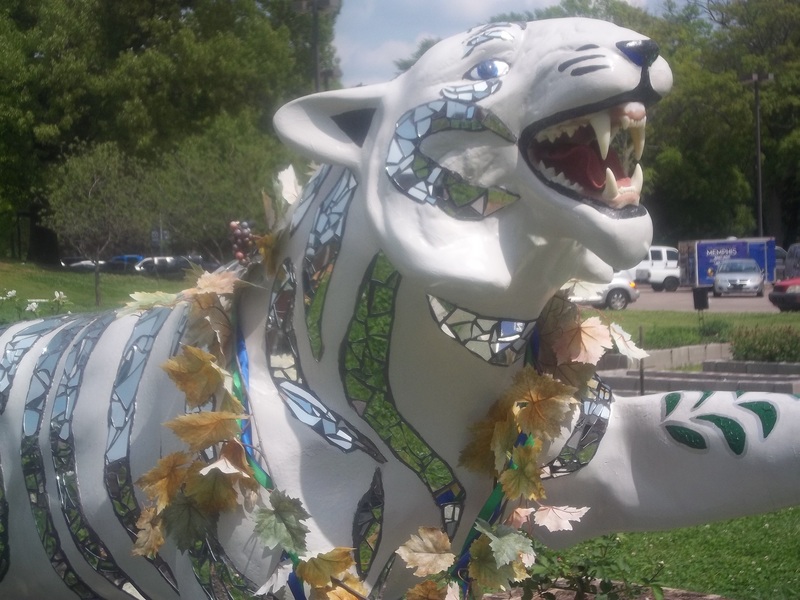 Originally, there were 100 tigers on campus, one to represent each graduating classes, but many businesses around town have purchased tigers to show their town spirit. The “Egypt” tiger is great. It connects the Memphis in Egypt with our own. I think my favorite is the Garden Keeper tiger than adorns the garden with its beautiful reflecting glass. Are there any community gardens where you live? Do you use them? Are they a success? Please, let me know in a comment! Is that Eqyptian wearing a bower hat?